Many prideful châteaux blush when reminded of fallow periods in their history, when quality languished below what is accepted today. It is nothing to be embarrassed about. A majority endured periods when they had little or no choice but to take whatever Mother Nature gave them and cling to the hope that every three or four years a benevolent season would deign a 1947 or 1961. On the other hand, sometimes these forgotten and frequently traduced periods are not as fallow as you might presume, especially in this Manichean age where we prefer to see things in black and white. These eras can be hunting grounds for bottles that repudiate received wisdom for reasonable prices. I was at 67 Pall Mall attending a 2017 Burgundy tasting when a friend invited me upstairs to meet his client, who had a bottle he wished to share. Well, who was I to refuse? I met a kindly gentleman who proffered a glass and asked my impression. I could tell it was a mature Saint-Émilion, nothing amazing, but perfectly clean. Its lightness was compensated by its balance and elegance. Yes, perfectly enjoyable. Now, what was it? It was unveiled as a 1975 Château l’Angélus. Predating Hubert de Boüard de Laforest’s tenure, it was made by his father, Jacques de Boüard, who had run the estate with his brother Christian since 1945. The 1975 l’Angélus was fermented in concrete vats and saw no new oak, so we’re talking old-school winemaking. It has a relatively pale hue for a Saint-Émilion and a degraded tawny rim. The bouquet is a little diffuse, but reveals attractive vestiges of brambly red fruit that ebb away to offer damp undergrowth, autumn leaves and light cigar humidor scents. The palate is not powerful but certainly balanced, with fine acidity. Not complex in the slightest, the 1975 certainly falls short of expectations given that this was actually a pretty decent Right Bank vintage, as anyone who has tasted Figeac or Cheval Blanc will know. 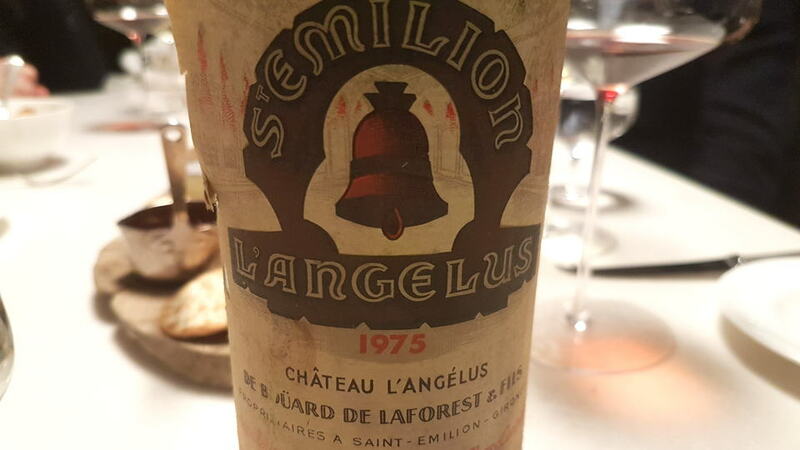 The nub of the matter is that the 1975 l'Angélus is perfectly enjoyable to drink, showing no obvious faults and no vegetal traits, while the tart finish is quite refreshing. My glass is soon empty. 85/Drink: 2019-2020. A few weeks earlier I had encountered another bottle from Jacques de Boüard’s era. This was tinged with poignancy, since he passed away on the day I visited to conduct a vertical of recent vintages (which I will publish soon). I gave my condolences to his granddaughter Stéphanie and suggested postponing, but he had lived well into his nineties and there was cause to remember and celebrate a long life... and share one of his wines. 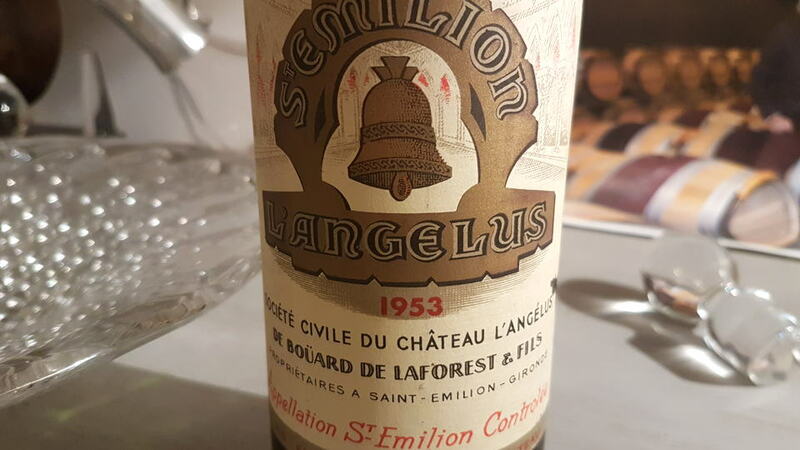 The 1953 l’Angélus, served blind, testifies to the quality of this Saint-Émilion in the post-war era. It is quite deep in colour, showing no signs of turbidity. The bouquet is fresh and nicely detailed, almost Left Bank in style thanks to the herbaceous note that is beautifully entwined with the blackberry, clove and scents of Lapsang souchong. The palate is well balanced, with quite rigid tannin at first, not what you might call an elegant Right Bank, but broad-shouldered and charmingly bucolic. Cosseted by no new oak, it is actually quite linear and classic in style, though not dry, with a cedar-edged finish that lingers in the mouth. The freshness and vitality after 65 years, and the manner in which the 1953 gains complexity and depth with aeration, leave you falling for its charms and itching for another glass. Bewitching. 94/Drink: 2019-2029. The moral of this story is: Do not dismiss entire epochs of châteaux and always approach bottles with an open mind – if possible, blind, as in case of these two bottles. The 1975 l’Angélus has the ignoble status of being cursed with a 50-point score from my former boss from Monkton. He is not alone in criticizing the wines from this period, so that is not a personal criticism, and of course, bottles vary from one to another. But if you could have witnessed our small party enjoying that 1975 l’Angélus, you would never have believed we were imbibing the same wine. There are only great bottles... etc., etc.